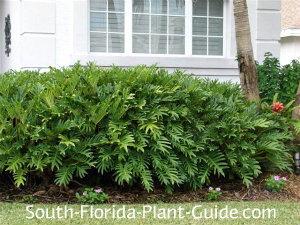 The lush and tropical Xanadu philodendron is an ideal small planting for homeowners who want little or no trimming. Xanadu philodendron forms a naturally mounded shape, a pillow of a plant with a delightfully different texture. The plant spreads out and leaves become more deeply divided as it matures. 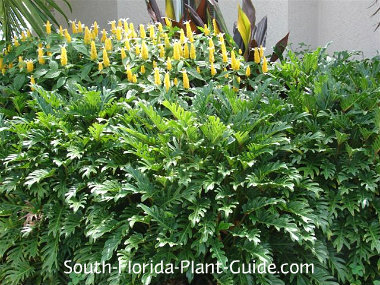 Xanadus are excellent planted alone or as companion plants for highlighting other, more colorful tropicals such as crotons and cordylines. Xanadus grow at a moderate pace to around 3 feet tall and 5 feet wide. They'll grow in sun or shade (depending how they're grown at the nursery) but vastly prefer a part sun or part shade location to look their best. This plant thrives in any Zone 10 location, and can handle warmer areas of Zone 9B in a sheltered spot with cold protection. Some parts of this plant are toxic if ingested. It's considered a deer-resistant plant and generally bugs don't like it either. Choose a well-drained area for this moderately drought-tolerant plant. Plant with a combination of top soil or organic peat moss mixed with composted cow manure added to the hole. 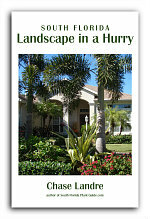 You'll rarely have to trim a Xanadu - its clumping growth pattern forms an attractive cushion shape all by itself. 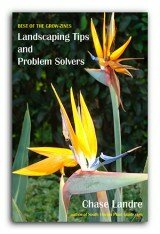 Water regularly but be sure to allow the plant time to dry out between waterings. Too much water can kill any philodendron plant. Place Xanadus 3 feet apart. This will seem like a lot of space in between at first, especially if you start with the typical 3-gallon size pot. 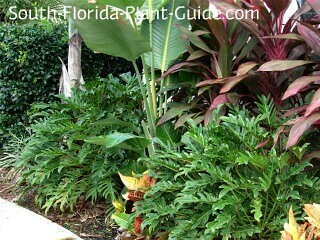 But philodendrons like the Xanadu need room to fill out and air circulation to keep them from staying too moist. Come away from the house at least 2-1/2 feet. Xanadu philodendron will do well in a container with the right amount of moisture, and can be acclimated to grow indoors. 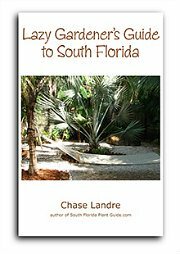 COMPANION PLANT SUGGESTIONS: For a part shade location, consider croton, cordyline and dracaena, peace lily, white bird of paradise, dwarf tibouchina, chenille, cape jasmine, golden shrimp plant, and heliconia.